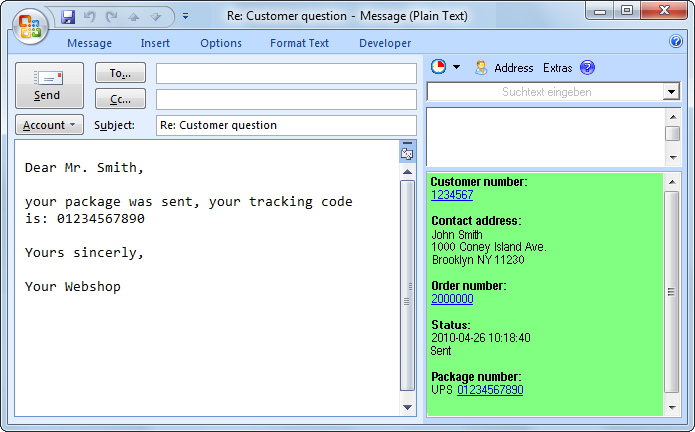 The version 4.05 of our text module software ReplyButler for Outlook is now available. The new version once again includes a number of small improvements and some bugfixes. Now it’s easier than ever to use plentyMarkets data in the boilerplate text module. Simply select the desired data from the token menu (lightning icon). Done. Furthermore ReplyButler now auto-detects data from e-mail forms when replying and you can easily hide the sidebar’s library buttons. And when your text modules adds recipients/CC/BCC now the program avoids duplicates when insert them. When updating to Microsoft Office 2007 or 2010 there’s usually a problem: Where is…? All the functions that you’re used to are now placed somewhere different. Even for the most simple functions you have to do a time-consuming search. Or use RibbonSearch. Or new tool has a lightning-fast search bar directory integrated into the office ribbon. Now you can easily find where the functions are now located. And more. You can also search the Office options to quickly find where you can configure which options. RibbonSearch is free for private use.